All Profits From This DVD Will Be Donated To Charity. 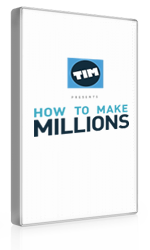 'How To Make Millions' is a DVD series where all profits from its sale are being donated to charity and it's the single most comprehensive guide ever created outlining EXACTLY how to turn a few thousand dollars into several million dollars within a few years. While it sounds like an impossible feat, Timothy Sykes & several of his top students and colleagues have done just that and now for the first time, they share all their secrets, best & worst trades and time-tested rules they've learned along the way during their incredible journeys. This DVD is a whopping 35 hours as it starts with the very basics of the stock market and stock trading and teaches techniques real self-made multi-millionaires have used to become wealthy. This is 70% off the regular price of $997. This is for the STREAMING version. To purchase the PHYSICAL version and have it shipped to you, click HERE.